There are many who are alarmed about housing conditions, about poverty stats, about derelict buildings, about stunted economic activity in our community and about a sense of social malaise that seems to permeate much of the discussion of events in Port Alberni. Here is a gentleman who has levered resources to deal with much of what ails us, coming to share his experience and methods. 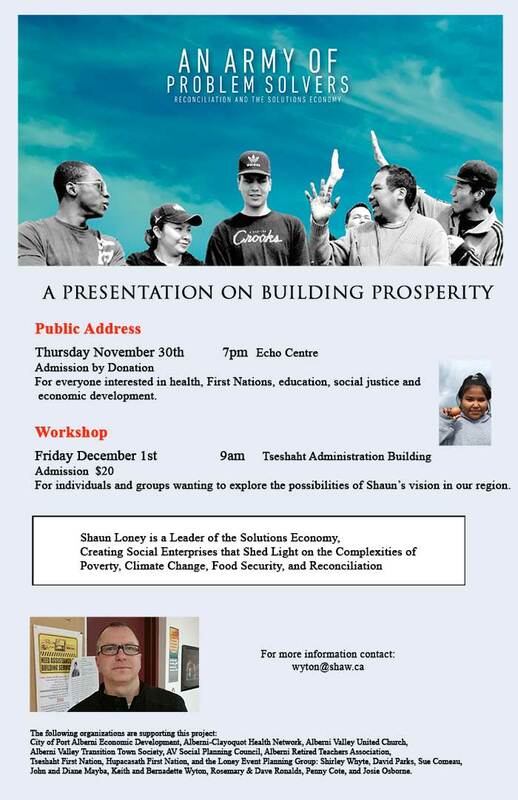 Please make the effort to come hear Shaun speak at Echo, and for those inclined to constructive action, check out the workshop at Tseshaht Admin the following morning. The diversity of the sponsors says something about the possibilities.